Roccamore shoes are designed by Danish footwear designer Frederikke Antonie Schmidt. Studying in Firenze, at famous design school Polimoda, and eventually staying in the city for 6 years, Frederikke worked for brands like MaxMara, Elisabetta Franchi, Shiatzy Chen, Icone, Chie Mihara, Sarah Chofakian and Mermaid, before she returned to Copenhagen to start her own label of comfortable high heels, designed for modern women, like herself, with a busy lifestyle and no time for sore feet. Roccamore design is elegant, classy and with a lot of attention to detail. The focus is on creating comfort, without compromising the aesthetics of the shoe. As an example, all roccamores have straps to keep your feet tight in the shoe and ensure maximum comfort of the insole. Roccamore shoes are handmade by world class Italian manufacturers in Toscany. 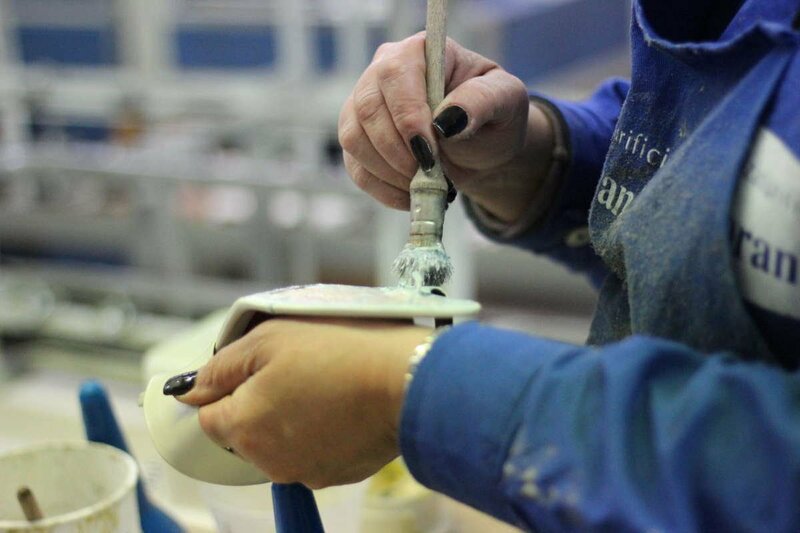 Our factory is a small, family owned business who has been making shoes by hand for 3 generations, and roccamore shoes are produced next to Valentino Red, Chloe Gosselin and Tabitha Simmons. When all materials are ready, a roccamore shoe takes 3 full months to produce and passes through 17 people and 22 steps before it’s ready. Most steps cannot be automated without compromising the quality. For example, cutting the skin is very complex, because the animal isn’t equally strong in all places, so the job can only be done manually by a worker with a min. of 3 years experience of working with Italian leathers. Roccamore shoes are not like any other shoes. Because of the specially designed insole all the components are designed and developed specially for roccamore. This is a difficult and costly process and part of what makes the fit so unique. Our shoes are made with the best Italian calfskin, the softness will mould them around your feet perfectly, and the material can stretch up to half a size, if needed, without losing its glow or elasticity. We believe in Slow Fashion and Fair Fashion, where good people are paid for their work and every product has been handmade to last a lifetime – although we do hope you’ll need more than one pair of roccamores in your life. The fantastic roccamore fit comes from our orthopaedic insole that is designed to shape your foot to walk as anatomically correct as possible in high heels. Frederikke created the insole in close colaboration with an orthopedic shoemaker with more than 15 years of experience, working with troubled feet. It took 2 years of testing and developing before the insole had the perfect fit and was finally ready for production. The roccamore insole is produced in a special kind of shock-absorbant latex that follows the contures of the foot, while allowing 2-3 mm to adapt to the uniquie shape of your foot – to fit you perfectly.